Watch out Comic-Con: there’s a hot new convention gaining traction in the technology world and it has nothing to do with super heroes. 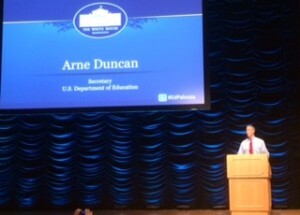 Education Datapalooza in Washington, D.C.
It’s Datapalooza, a joint effort between the White House, the Office of Educational Technology, U.S. Department of Education, and the Office of the Under Secretary that brought hundreds of education innovators to Washington, D.C., earlier this year for the ultimate networking session. But this was no trade show of SmartBoards and homework apps. Datapalooza’s guests are at the forefront of the latest generation of educational products, services, and apps; more important, they have been tapped by the U.S. Department of Education to act on President Barack Obama’s 2013 call to entrepreneurs and technology leaders seeking ideas that will make college affordable for American families and to increase the quality of online teaching and learning tools. In reaching out to the private sector, the administration aims to foster creative cooperation among industries in its effort to meet its education goals. 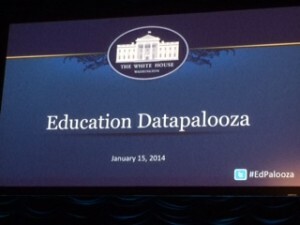 Fueled by a ready supply of education facts and figures made available through the federal government’s 2012 Education Data Initiative, the name of the game for the innovators of Datapalooza is to get more students en route to a post-secondary education, affordably. best system of education in the world, it’s mired down in “a very inefficient marketplace” that offers an abundance of schooling options, but fails to effectively provide the tools that make those options a reality. 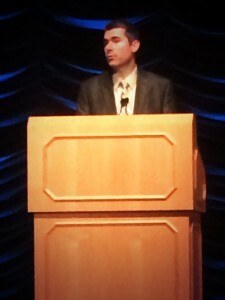 Citing decreasing college-graduation rates in the U.S. over the last generation, Duncan identified the solution to this disconnect in no uncertain terms. Based on the variety of products, services, and ideas represented at Datapalooza, education innovators appear ready to fight. A series of “lightening round” presentations by event attendees revealed a booming virtual marketplace where students can find typical necessities like textbooks, tutoring, and student-loan calculators; or they can seek out more specific tools like college-course notes and resources, special-needs services, freelance gig databases for students, faculty evaluators, and a variety of online courses in a spectrum of subjects (game design, coding, and high school basics among them) — and much more. For edtech entrepreneur Ryan Duques of Tutapoint.com, a firm that provides online tutoring and test-prep services to high school students in a variety of courses, Datapalooza provided more than news and updates from the education-innovation community. While he lauded the variety of the presenters, he identified another benefit of a gathering of this magnitude. “The White House has an amazing ability to attract and convene leading technologists and education industry thought leaders from around the country. Putting all of this brainpower under one roof leads to an exceptional opportunity for edtech entrepreneurs like myself,” Duques said. Where Duques’ services employ and encourage technology to better prepare high school students academically for college, LinkedIn – one of Datapalooza’s presenters – is leveraging the social technology behind its network to help guide students through the college-selection process. Similar to its networking services for established professionals and companies, LinkedIn now offers University Pages, designed for students seeking school information and, perhaps more important, introductions and connections to a school’s alumni, many of whom already may be connected to the prospective student. Through University Pages, a student interested in, say, New York University, can learn more about campus life, look up notable alumni or graduates in a given field, research career trends among alumni, find graduate schools, and simply make new friends, among other options. Hundreds of colleges have created University Pages, since the initiative’s launch in August 2013. The name of the game is using technology to create reliable support networks, according to Christina Allen, director of product management at LinkedIn. Whether they get a student into college or help to make the transition to college easier, what all these tools and products have in common is the ability to reach more students, faster — which gets the U.S. that much closer to achieving President’s Obama’s education goals.